The moist, hot Guatemalan air encompassed me as soon as I left the comfort of the overly air-conditioned sanctuary that was the motel room. After attempting to adjust to the bright morning sun, I soon was choking on the fumes of a concoction of sunscreen and bug spray. It was going to be another day full of adventure- I felt it. Group meetings were always held in the mornings and led by Javier, the expert on going on Guatemalan mission trips. “Okay girls! Today we are going to see some schools!” he proclaimed enthusiastically. A unanimous squeal of excitement left all our mouths as we sat around eating our breakfast. Christy and Holly, two girls that had been Guatemalan Youth Ambassadors the previous year, practically jumped out of their seats. They were always telling us, the new Youth Ambassadors that their favorite part of their trip was going to see the children. With that being said we quickly shoveled the last of our breakfasts into our mouths and ran to the small caravan of pick-up trucks that would take us up the winding, rocky mountain roads to the schools we would soon be visiting. After what seemed like five hours of a bumpy ride to the school, we finally arrived. There was a small army of children gathered in front of a raggedy two room school house. The kids seemed timid, hiding behind each other and whispering. With some dressed in uniform and others dressed in tattered regular clothing, I was sure that these were the children who were not able to afford the uniform. The teacher approached us first. He was both the teacher to the younger students as well as the older students. He also doubled as the principal. This bewildered us all. This teacher taught first through fifth grade in the same room on any subject matter that they could possibly find one textbook on. Most of the textbooks were yellowed, tearing at the seams, and crinkled up – one would have to use the gentlest touch to turn the page in order to prevent it from crumbling. Nearly thirty two percent of Guatemala’s population is illiterate and when taking into account the indigenous population it nearly doubles to a frightening sixty percent (Guatemala). One of the textbooks used at the school. 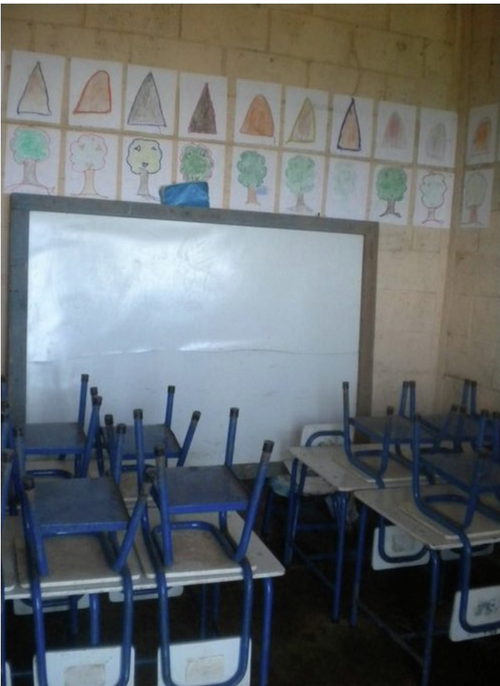 Our first task when arriving at the school was to start cleaning the two rooms. The floors were caked in dirt and just when you thought you were finished, a new cloud would coat the floor with an unwavering stubbornness to separate itself from the tiles. Some of the older children were aware that we were struggling and without being asked they grabbed a mop, broom, or sponge and helped scrub the infinite amount of dirt that clung to the classroom floors. The school was extremely poor and catered to the children that were able to walk there. Many of the children are sent home because they are so hungry that they have a hard time paying attention. Sixty one percent of the children in Guatemala are undernourished; Guatemala has third highest malnutrition rate in the world, as well as stunted growth (Beckett). The principal explained that he cannot stop any children from leaving during the day because he knows he cannot feed them. The children were so shy, but with the incentive of lollipops, many of them blossomed from shy caterpillars into social butterflies. They urged the other ambassadors and me to quiz them on the little English they did know and tell them the words they were curious to learn. These are the lucky boys and girls of Guatemala; many do not get to attend school due to the fact that their parents cannot afford to send them to school and instead have the kids help with farms, small businesses, or assist running the house. Many children that live in the rural poor section are only in school from four to six years if they are lucky (Guatemala). Only three out of ten children in Guatemala graduate the sixth grade (Guatemala). Though it was a quick stay at the school, many of the kids clung to us as we left, giving us multiple hugs and kisses as if each sign of affection was saying “don’t forget me”. We loaded back into the pick-up trucks and waved goodbye wondering if they would remember us or if they would miss us as much as we would miss them. Next, it was time to visit another school; when we go there the school was visibly different. It was painted in bright vibrant colors, with children’s drawings all over the cement wall that surrounded the school. The courtyard was filled with people both from the school and the surrounding community cheering and welcoming us there. Filled with smiling tanned faces, each person took their turn giving their “bendicion” (blessing) followed by a quick hug and kiss on the cheek. These children were so excited for our arrival they prepared songs and dances for us and urged us to sing and dance for them, too. The kids were astronomically better than our broken down, unharmonious attempt to sing nursery rhymes. Nonetheless they laughed and had fun watching us attempt to rival their perfectly pitched children’s choir. Their teachers then sent them off to their classrooms where we would attempt to teach a class colors, fruits, vegetables, and numbers in English. Something that was very different between both schools was that the second school we visited had children with special needs. Most kids and adults who require special services are more often than not, left at home and not taken outside due to the lack of places that are willing to care for them. In the entire country of Guatemala, there are only three places that cater to the physically and mentally handicapped. I remember thinking how admirable it was that a child’s parents had sent him to a regular school in order to obtain an education. Though there are many limited places that people can go to seek help for their handicaps, I had the privilege to visit one of three places in the entire country of Guatemala. In a sense it was an oasis for those stuck in a barren desert. 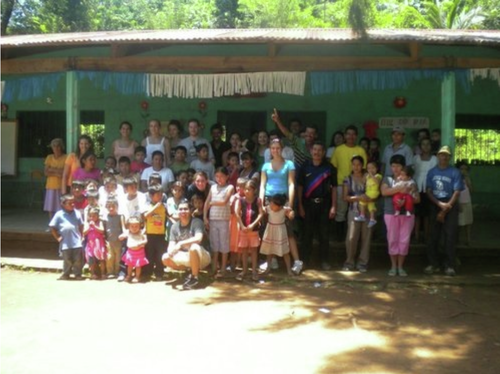 Nowhere in the country provided the same level of low cost care, education, and general resources that Father Juan, the director of the facility, provided to the handicap, their families, and the surrounding community. Hailing all the way from Spain, Father Juan was a savior to the community, his heart is made of something even more pure and precious than gold. His facility was a haven that included a pristine doctor and dentist examination room, a small pharmacy at where he sold medicine for whatever a person in need could afford, a garden to grow coffee beans as well as vegetable and fruits, a cafeteria, and a series of classrooms in which his patients participated in a series of engaging activities. And as if this wasn’t enough, he also supported efforts to stop drilling for precious jewels, which has contaminated the drinking water, depleted the rivers, and completely demolished a once abundant forest. He invited us to join his fight and handed us t-shirts protesting the mining that was flipping the community upside down. Father Juan instilled a sense of importance, self-reliance, and creativity to the people that came daily to his facility and was a source of inspiration to his visitors. A lot of these lessons were through the emphasis on working to cultivate their own home grown coffee beans, maintaining the facility, and participating in the arts. This made for a relatively normal life for people who were never properly cared for. In emphasizing the arts, Father Juan gave many of the patients an outlet to escape from the realities of life even if it was for only a few hours during the day. He even led us through an arts and crafts class and technology class that were being led by the facilities volunteers. We were in awe of how beautifully and effortlessly the facility ran. Everyone was so happy to be there whether it was a visitor or a volunteer. Father Juan hosted a nation-wide talent competition to showcase the work his patients, as well as patients in the other two handicap facilities in Guatemala, had been diligently working on throughout the year. He handed us all pamphlets that he had made for the previous year’s activities with such enthusiasm and excitement that it made me want to stay an extra week just to attend the celebration. Father Juan was one of the greatest gifts the community had ever gotten. I truly do not know what this community would be like if he, like many potentially great gifts, got misplaced, misguided, or misused. Many of the places on this eye opening journey throughout the mountainous Diocese of Santa Rosa appeared the same to me. At first glance it was merely an overcrowded school with no funding. But it finally struck me three and a half years later. What struck me as amazing is remembering the desks, chairs, and tables being piled into one classroom. This meant that there was an abundance of children who were willing to learn and if they were learning they were more likely to continue their education. With them continuing their education, they would be more likely to make it out of the poverty they currently lived in. 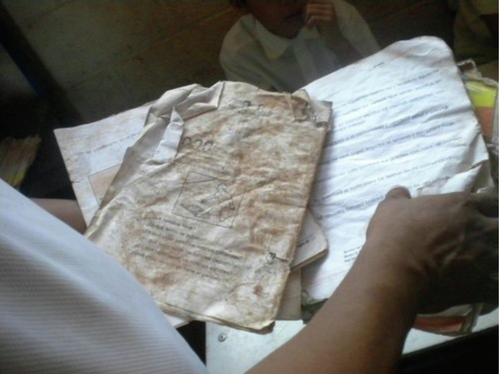 Education was a long ladder and the kids were escaping it rung by rung, slowly climbing out of the gaping hole of poverty that often swallows many of the children of Guatemala. The rest of the day was spent playing in the courtyard and singing songs. To this day I still wonder if any of the kids I met that day made it to the top of the ladder. It is our duty as those who have the access to an education to begin seeing the incredible power that education has on the individual and how much we take the idea of a quality education for granted. In countries with extreme poverty, like Guatemala, attending high school and college is like shooting for the moon but never making it past the Earth’s atmosphere. I encourage you; the educated individual reading this, to take a mission trip. Walk a mile in impoverished shoes, then come back and spread the word on the toll poverty takes on a child’s education. Show the holes and tears in the shoes you wore struggling to climb the ladder that many children dare to ascend. 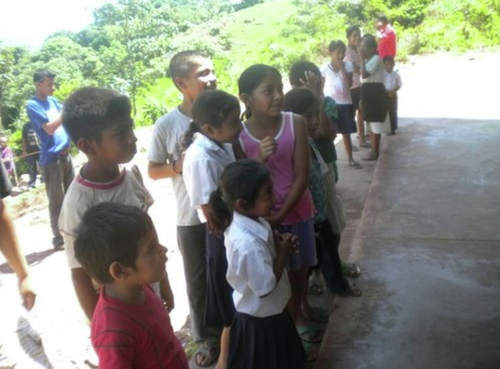 Through awareness, we can make the ladder less steep for the children of Guatemala. Beckett, Megan and Anne R. Pebley. “Ethnicity, Language, And Economic Well-being InRural Guatemala.” Rural Sociology 68.3 (2003): 434-458. Print. “Guatemala.” Global Education Fund RSS. N.p., n.d. Web. 10 Feb. 2014.<http://www.globaleducationfund.org/what-we-do/guatemala/>.